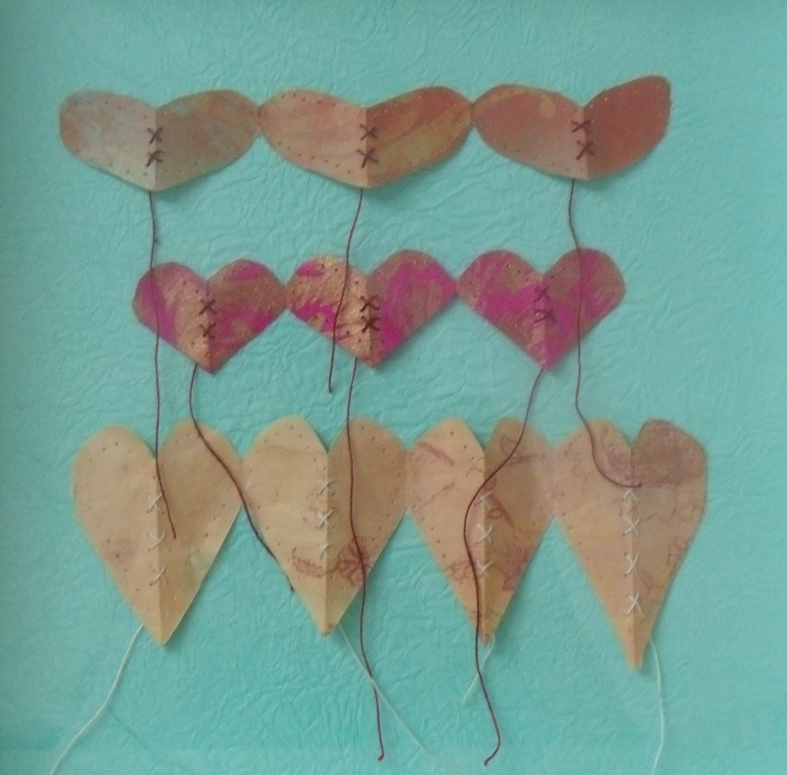 ‘Wings and Things’ is the working title for an exhibition being developed for the local community’s annual “Westbury Park Festival”.…last year we hosted a drop-in making felt flowers – this year we are show-casing the talents of the staff and tutors at Heart Space Studios – so no pressure! 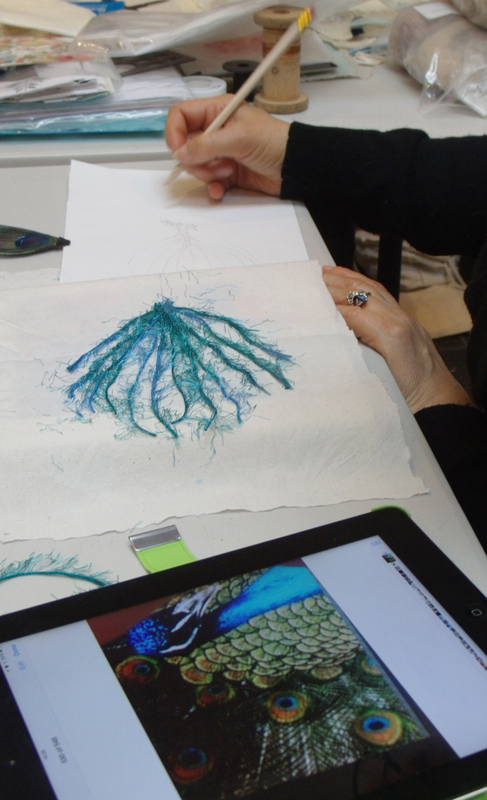 It is always fascinating to see how each person responds to any given the brief: we had asked for any ideas and drawings/ samples of work ready to be discussed on the day – we wanted everyone to participate in helping one another develop ideas, otherwise working in a group can be really distracting. Steph Wooster brought several real birds wings that she had been given by a local game butcher, plus some tiny drawings in the goes-everywhere-with-her-sketchbook. 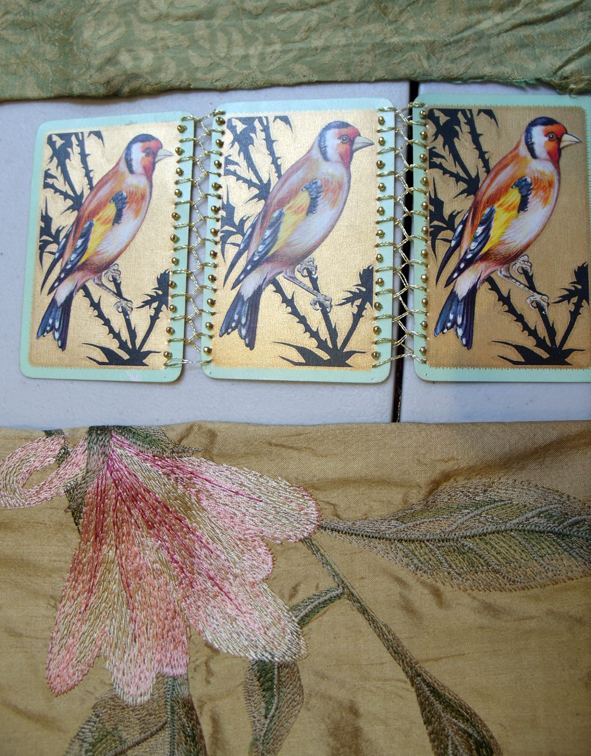 She placed the book open at a pigeon drawing next to a bag of – to my mind – Pigeon Coloured materials…. 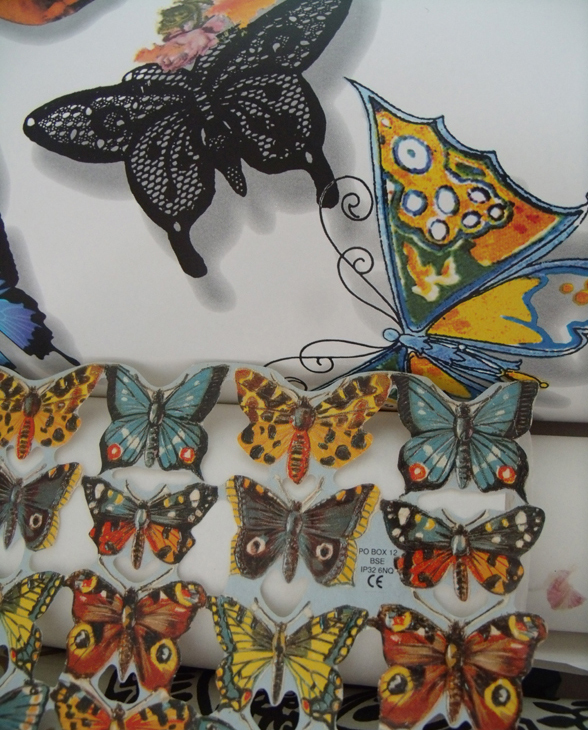 Ilaria Padovani, brought a couple of samples specially prepared for the day – one a pair of collaged wings which was bright and busy, but another patchwork made from a pattern that her grandmother had made for her as a child it was her favourite winged thing – the dragonfly – and it is full of flight! 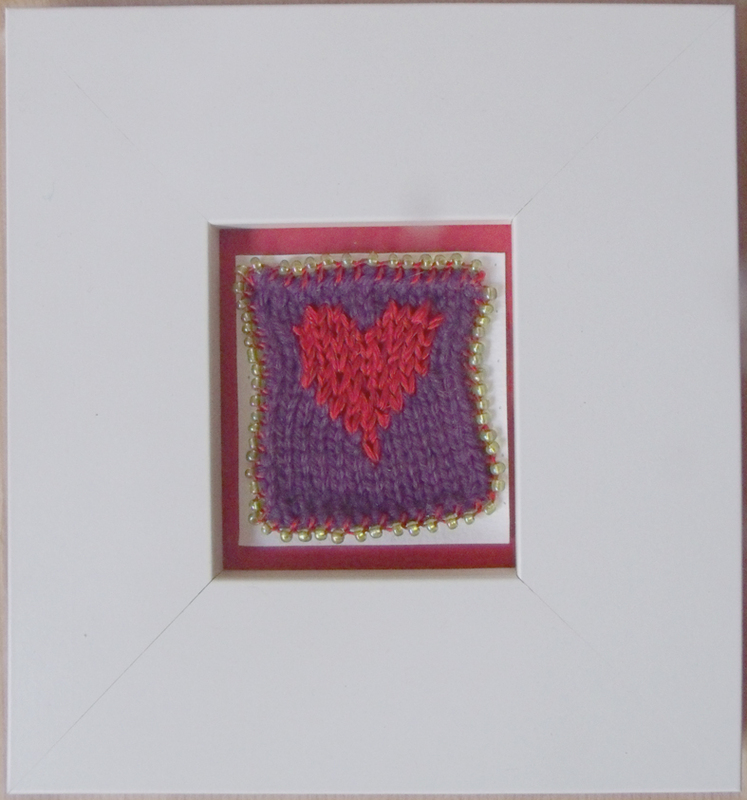 We immediately advised her to just make lots and lots of them in all sorts of different colours and to exhibit them flying randomly across the walls. I had brought in several frames to establish various sizes of each piece – Debby and I needed to have an easy hanging session prior to the exhibition opening. 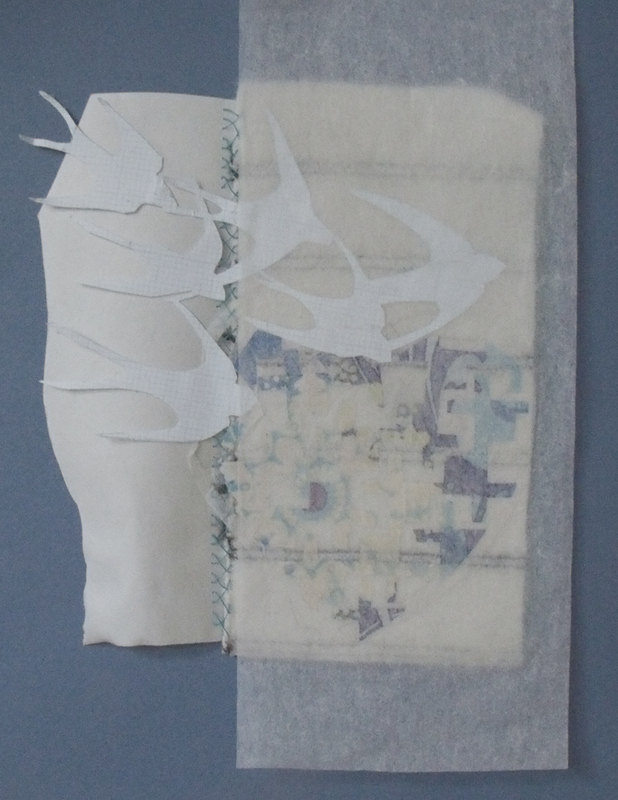 It was decided to wrap the dragonfly patches around small stretched canvasses and so keep them light and airy. 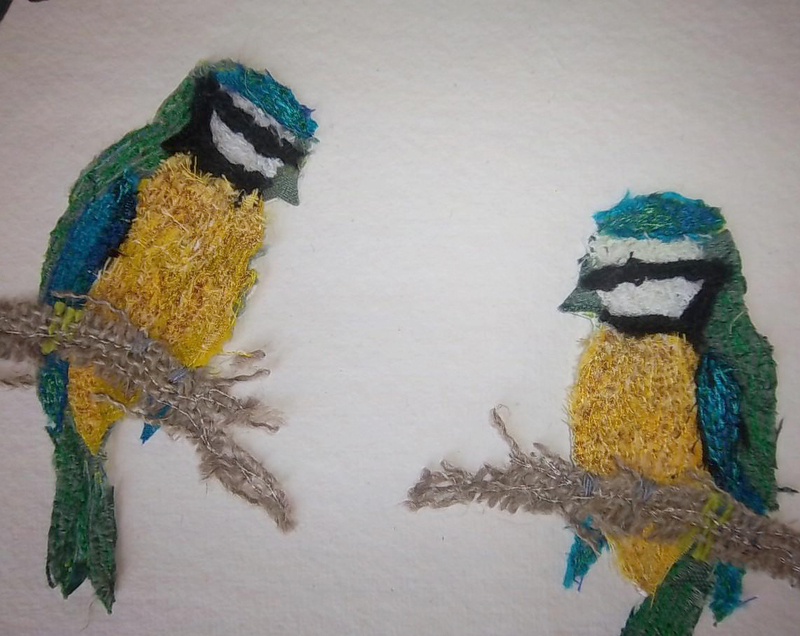 Many textile artists, regardless of name, work with bird imagery; Mary Bishop has made several pieces of bird related embroideries and so she brought a few of her early samples and an open mind, as it was her first tutor’s making group attendance. She is really taken with the idea of Magpies – after all they do like bright shiny objects and we always have lost of those at Heart Space. 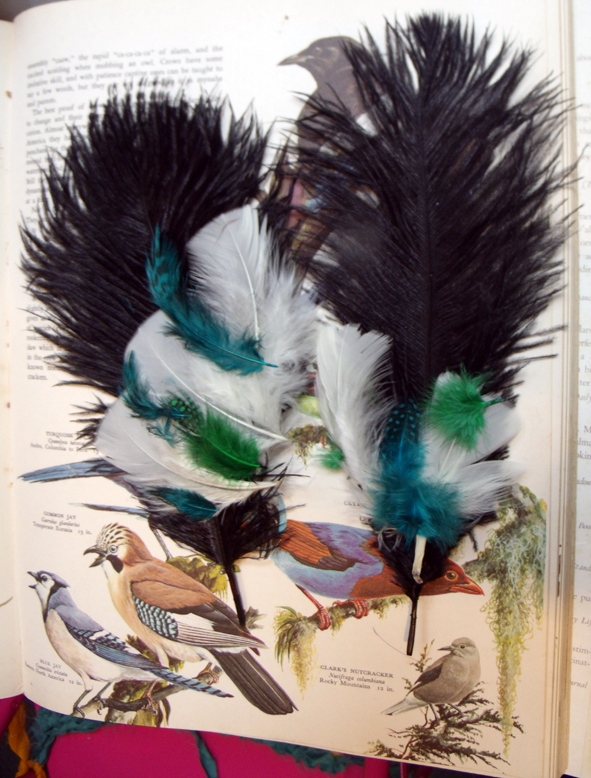 glamorous feathers placed on top of a vintage bird book I had brought to the workshop – a really good idea for further collages here. 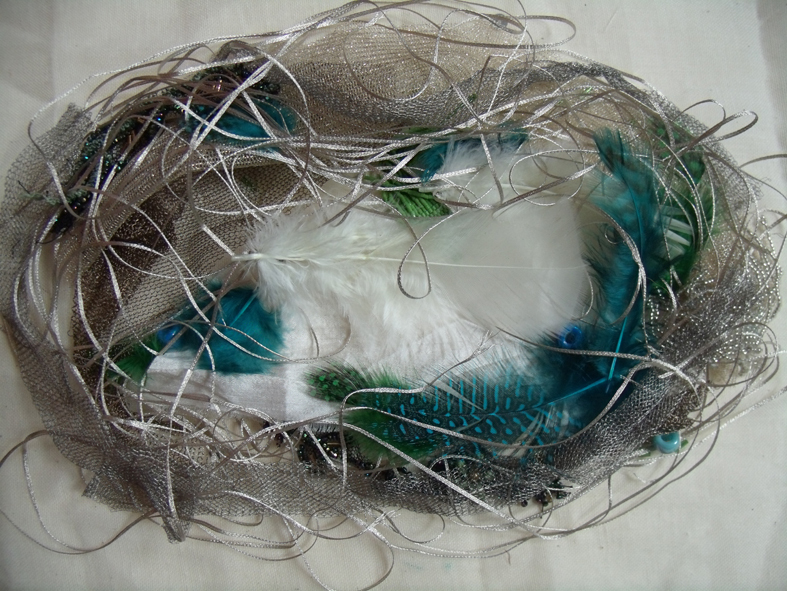 I thought she should start with the nest – I mean she can easily do the birds at home alone – but the nest and it’s contents could be found in the studio stash….I asked her to just find lovely things a magpie might steal from us and then to make a nest from them, later she can choose to use parts of it as a sort of grounding for the birds or develop other ones from other materials….the ideas are endless here. 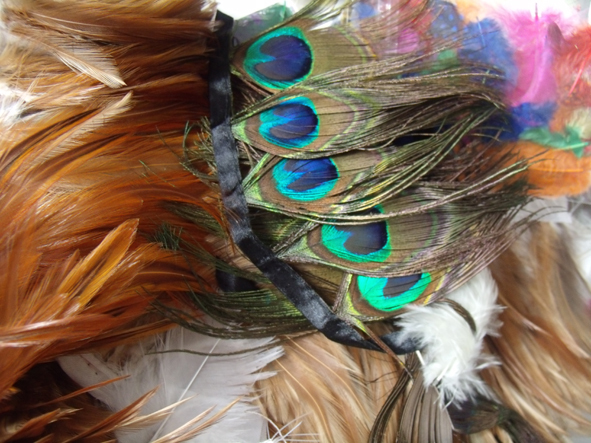 striped of silk fabrics to make into a 3D bird cage….a really innovative idea and a lot of interesting work to develop. during the introduction when everyone had to show and talk about their own ideas she liked the idea of making a cage from a sample made in an earlier workshop. 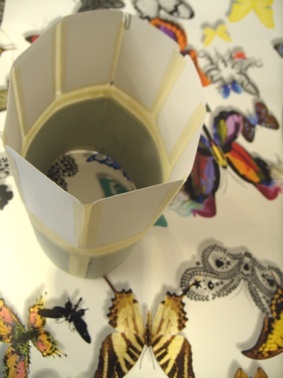 She set about making a prototype in card and tape to ascertain the sizes and shapes required – but what will the cage contain? 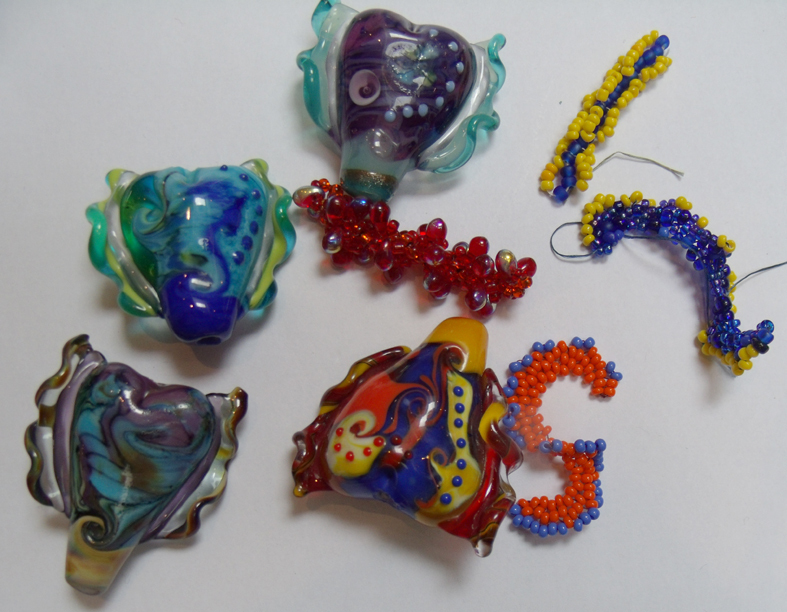 One way to use a themed exhibition is to try something new or an idea that has been on the’ back-burner’. I think Kirsten Hill-Nixon thought this way. 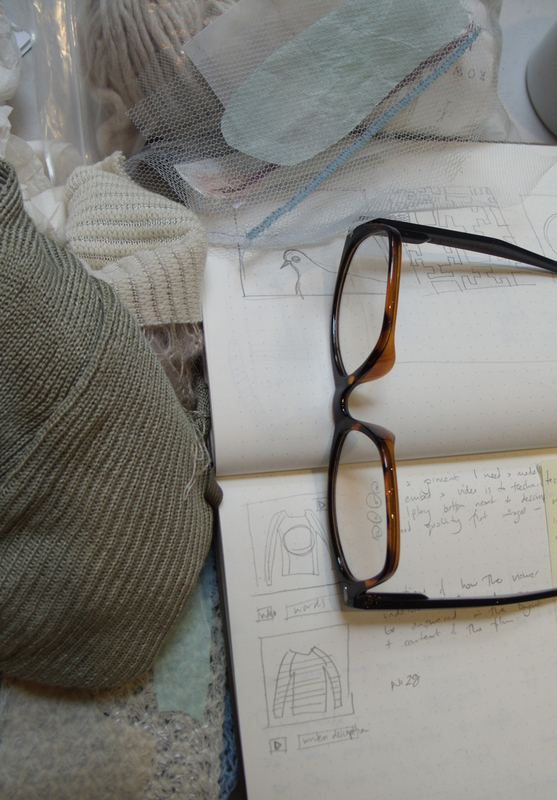 She arrived with lots of well organised materials, books and ideas – lots of drawings in her research book and a firm grasp of what she wanted to achieve…it’s a tall order! 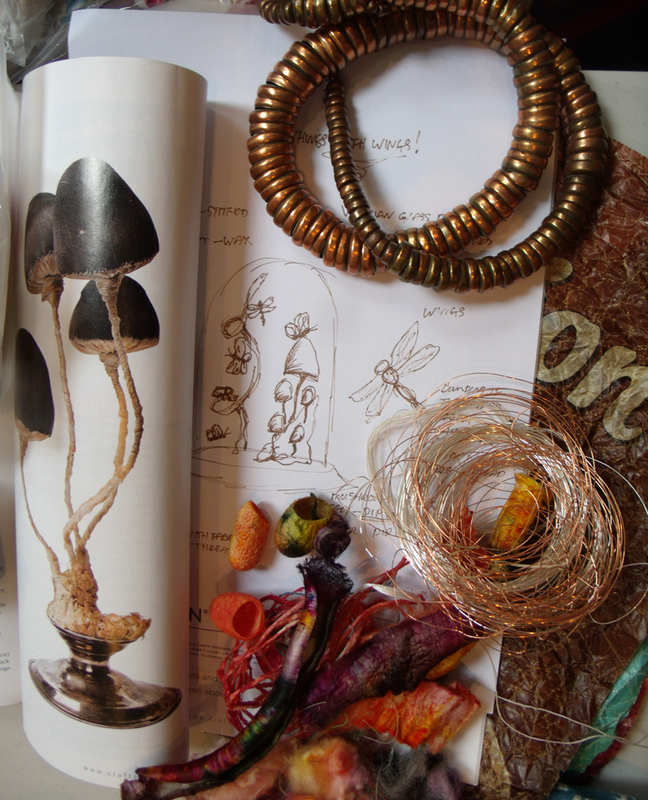 Kirsten wants to make a series of exhibits of ‘natural’ objects trapped under glass domes…she is making different types of what look like fungi and cast off chrysalis shells. 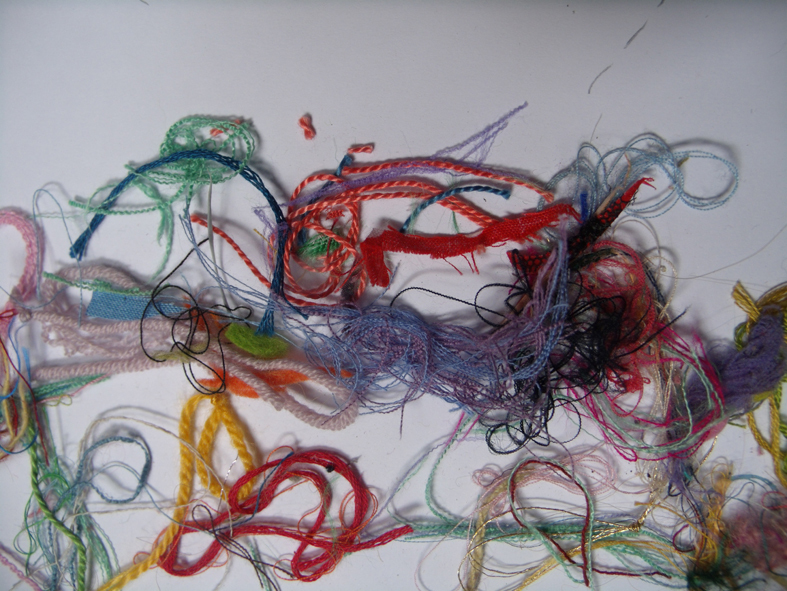 She is making them out of all types of fabrics, waxed and “preserved” – I found these curious things near a batik kettle – where are the winged things that maybe emerged form them? 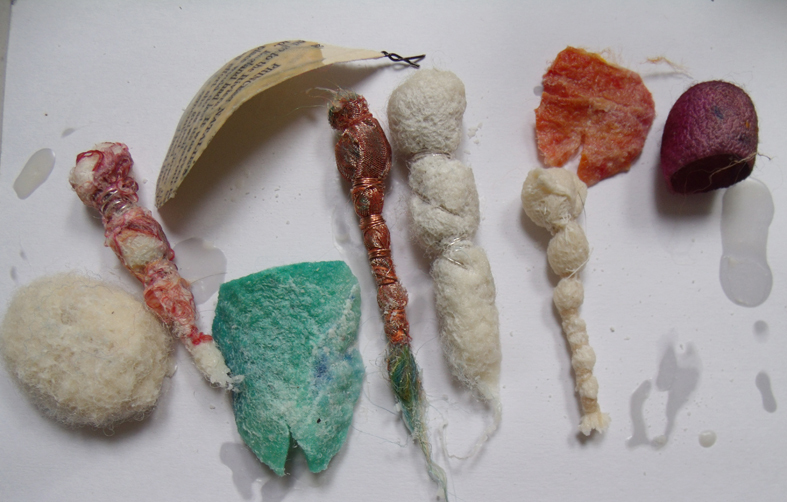 waxed casts and wrapped objects for Kirsten Hill-Nixon’s curious collections of post-flight litter? 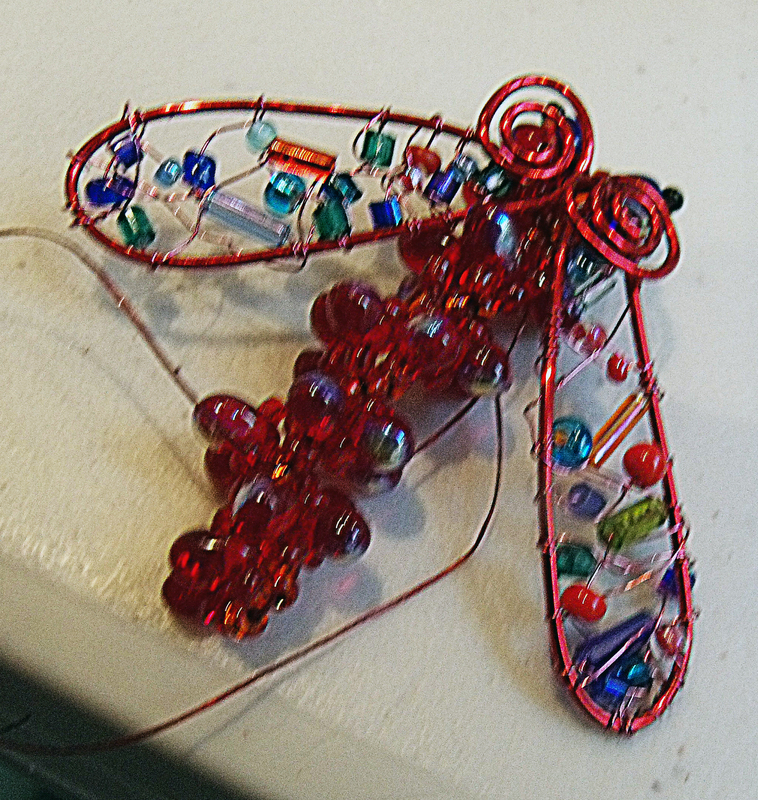 Debby Bird had made lots of tiny wings and insects using twisted silver wire and she suggested Ilsa make some and by the end of the session when the red beaded winged thing emerged we all wanted to wear it, either as a brooch or worked into a necklace. 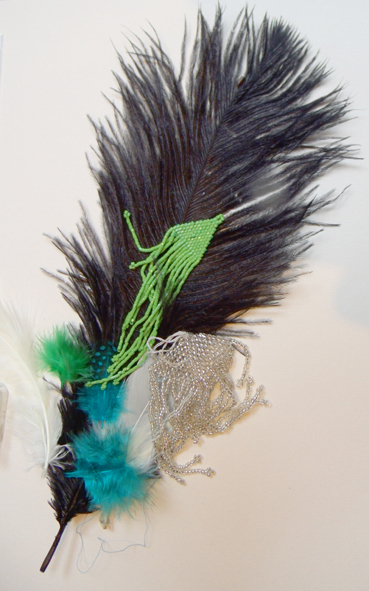 Debby Bird always has lots of different media to develop into new and desirable objects and images…she excels in hunting out amazing new products and manages to incorporate them into her work…unlike the rest of us! 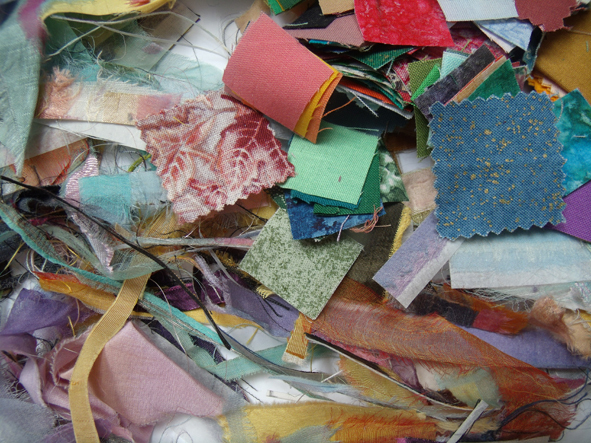 She had made several different samples prior to the session but the thing she settled down to was an idea from her paper cutting experiments. 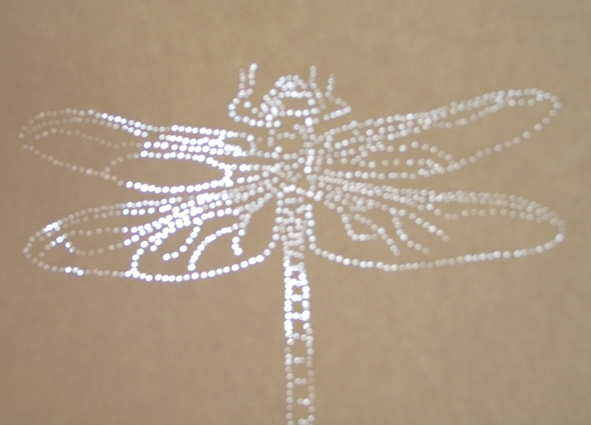 the results of a long time piercing the paper with a needle was ethereal and beautifully nuanced when see against the skylight. 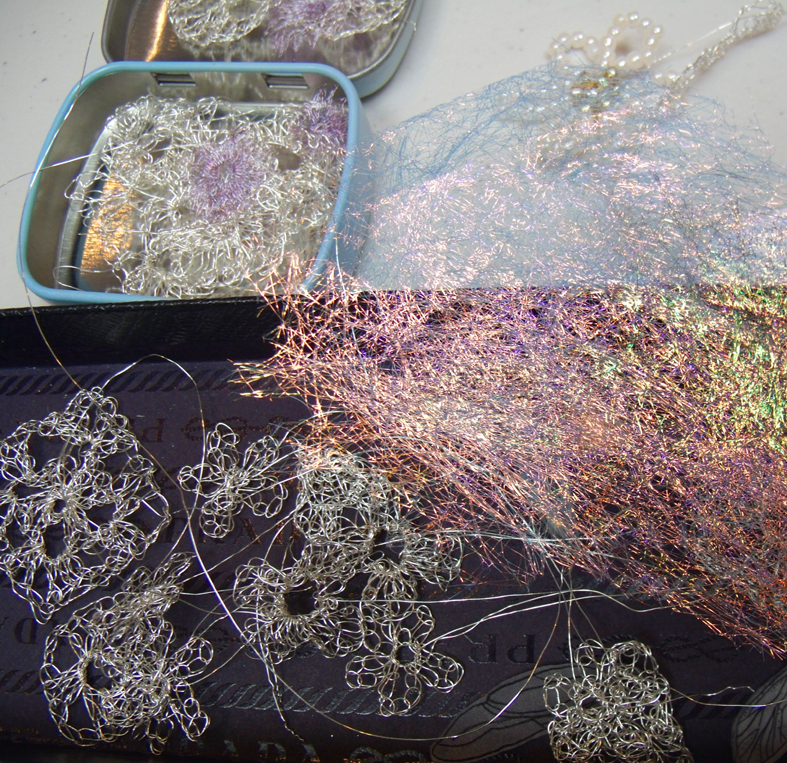 I am looking forward to seeing how this essentially simple idea is developed into further work….all sports of light fitments and holders could be made – I must give her some vellum to sample. 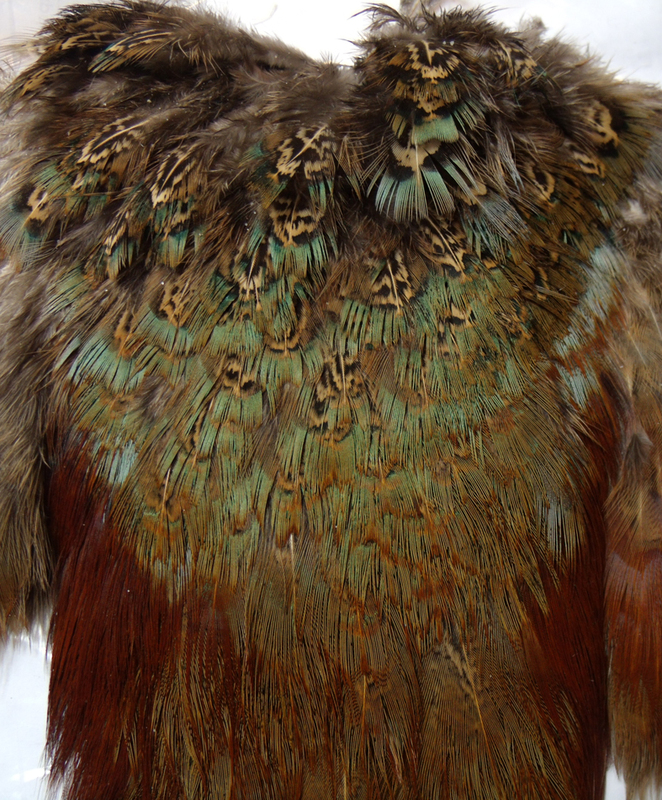 Sitting next to Debby, who by piercing paper was working with one of the most primitive way of making a mark, was Ceema McDowell, busily using the most modern of research tools to develop her peacock design…the strands of random dyed woollen yarn is reassuringly traditional. 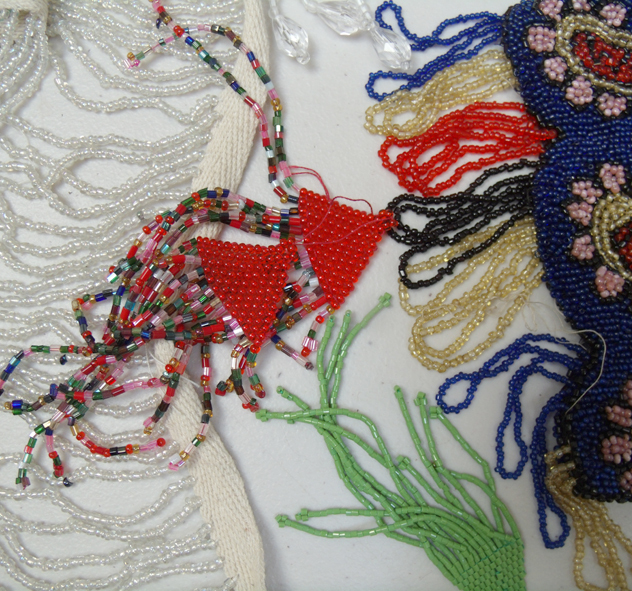 And to me – what did I get to do? 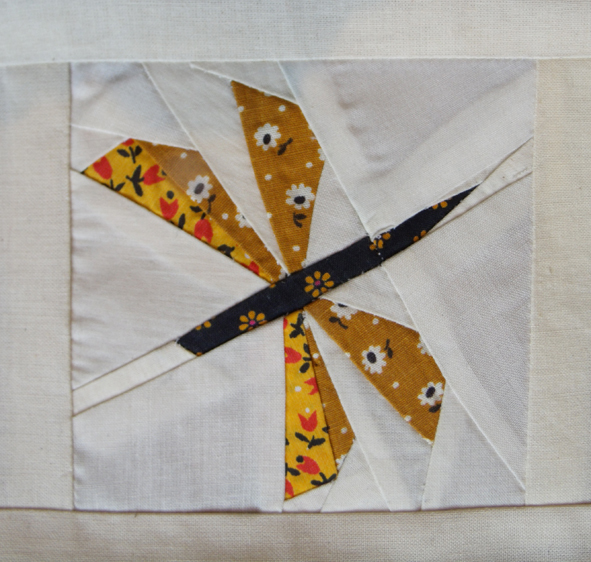 well not a lot on the day but I have had a frivolous idea for this project – it is not at all what I usually concern myself with, but it would not go away….so I told the group to see how they would react – they laughed but said it could be really interesting. 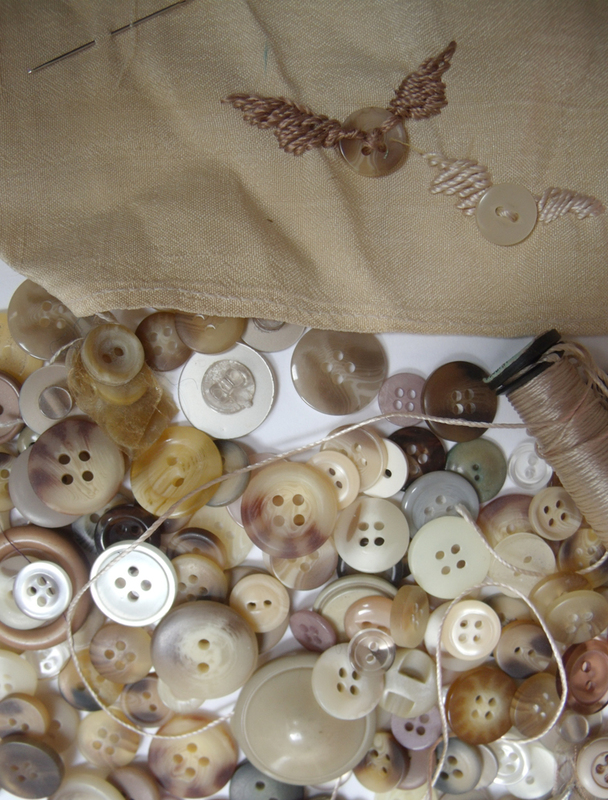 as well as spilled beads or left over buttons…….it was the buttons that made me ponder: why are there always masses of Beige Buttons left unused in any button collection? I started to imagine where all the unused beige buttons will eventually go; will they fly off to a beige button heaven? 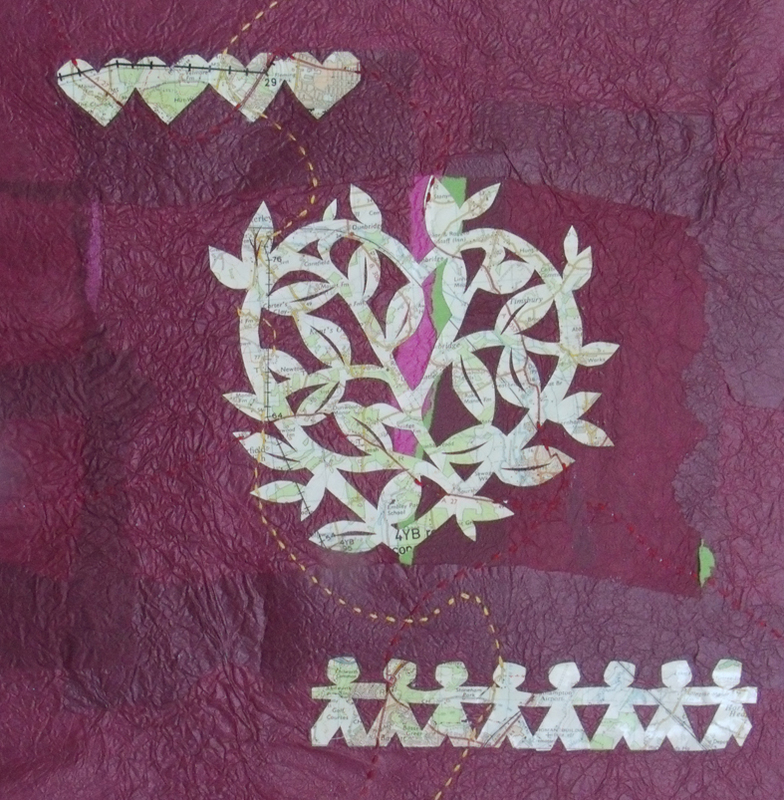 Will they then become pearl buttons when they were beatified? 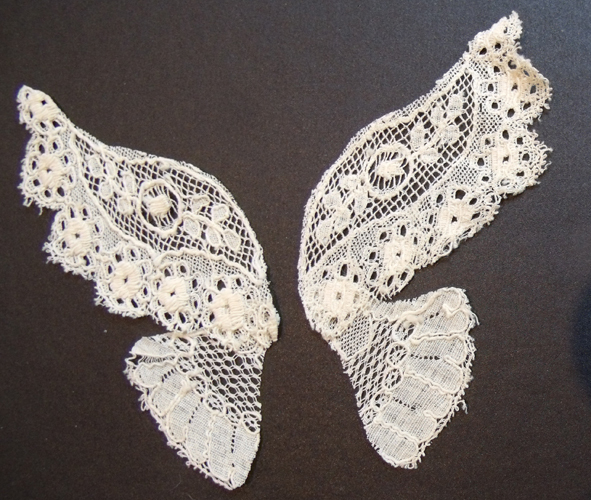 I also thought of the threads and the fabric scraps…what would become of them if they flew to heaven – how would their wings look and what’s more – what would their eventual version of heaven look like? 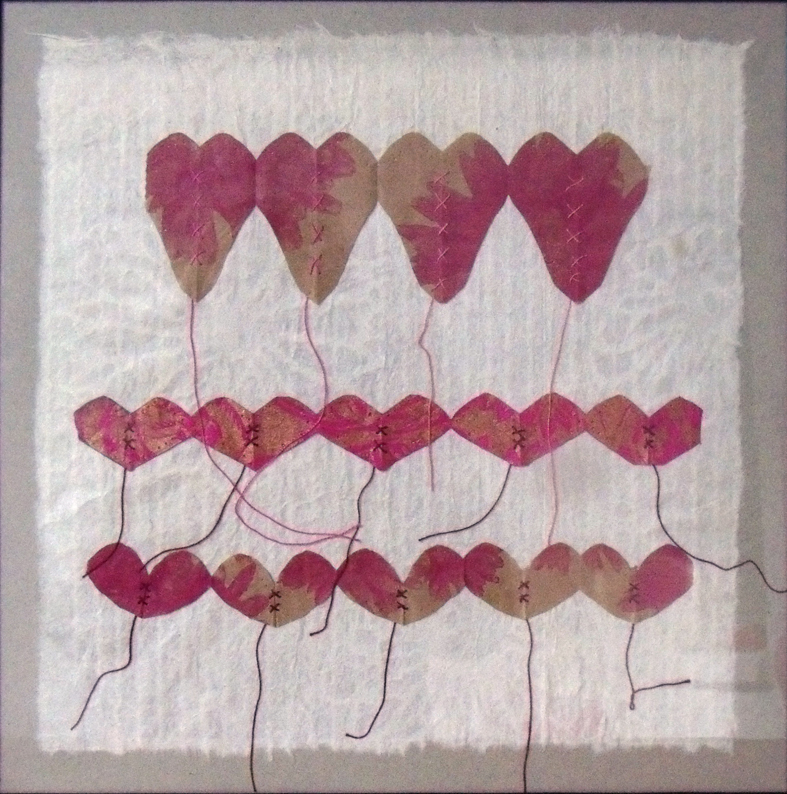 Categories: Heart Space Studios, Make - Do and Mend, Stitching | Tags: beige buttons, mixed media textiles, perforated papers, textiles | Permalink. 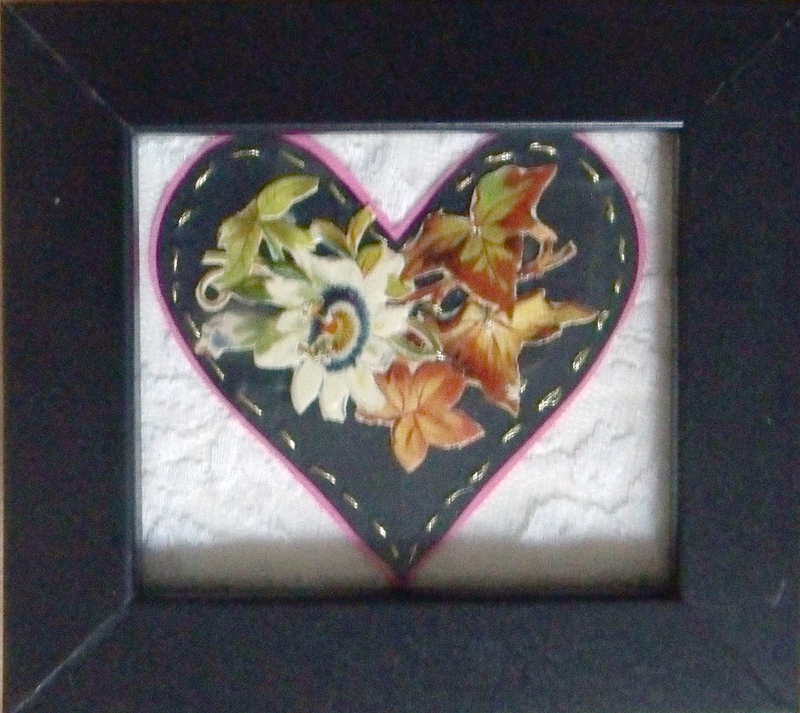 The small but delightful exhibition that the Heart Space Studios staff made in the mixed media session are all framed and ready to go on the wall …. 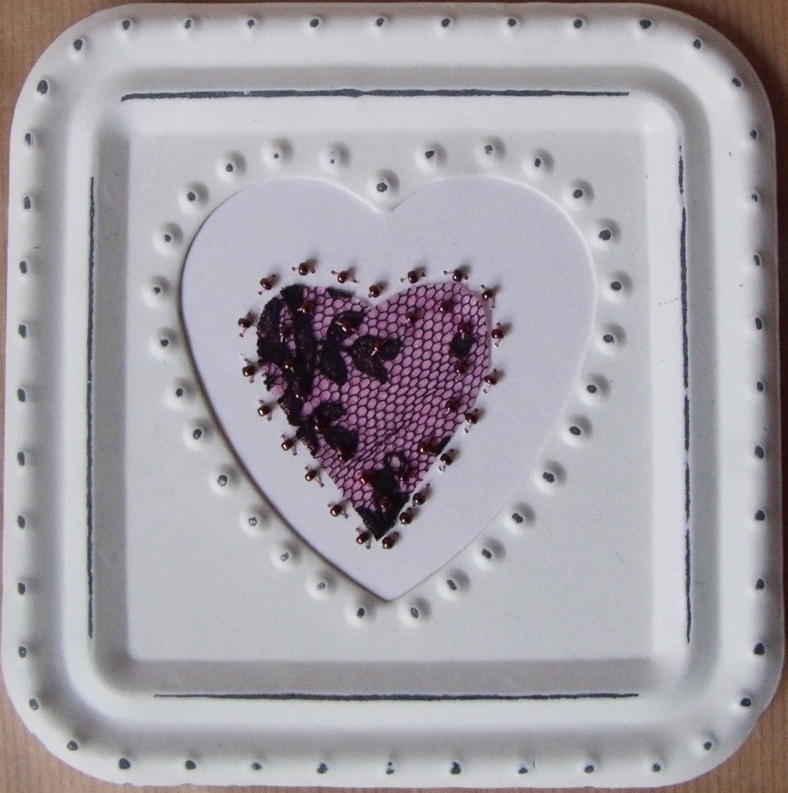 the tiny hearts are somehow the most appealing, they came in all manner of materials and techniques…. 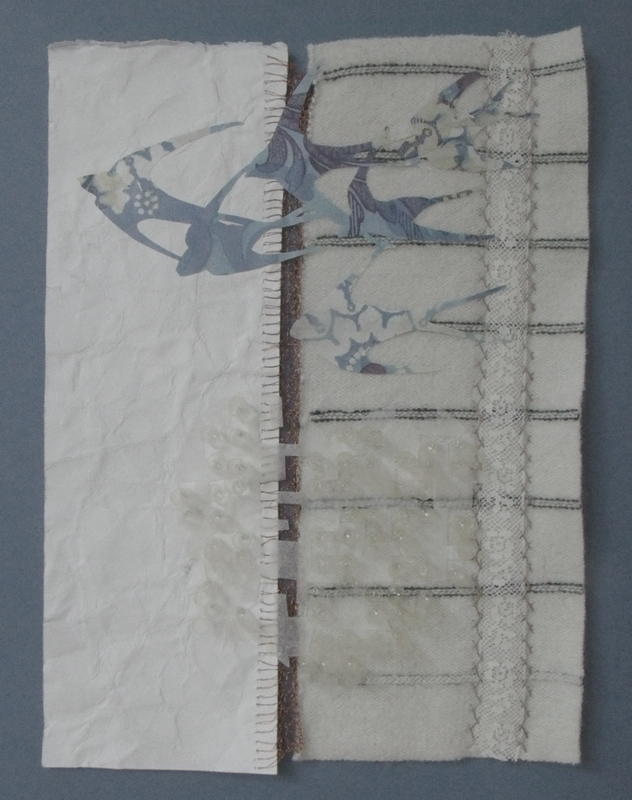 the third piece is an intricately cut applique of shredded bank notes, paper and woolen blanket stitched and knitted with copper wire…now that’s what I call mixed media. 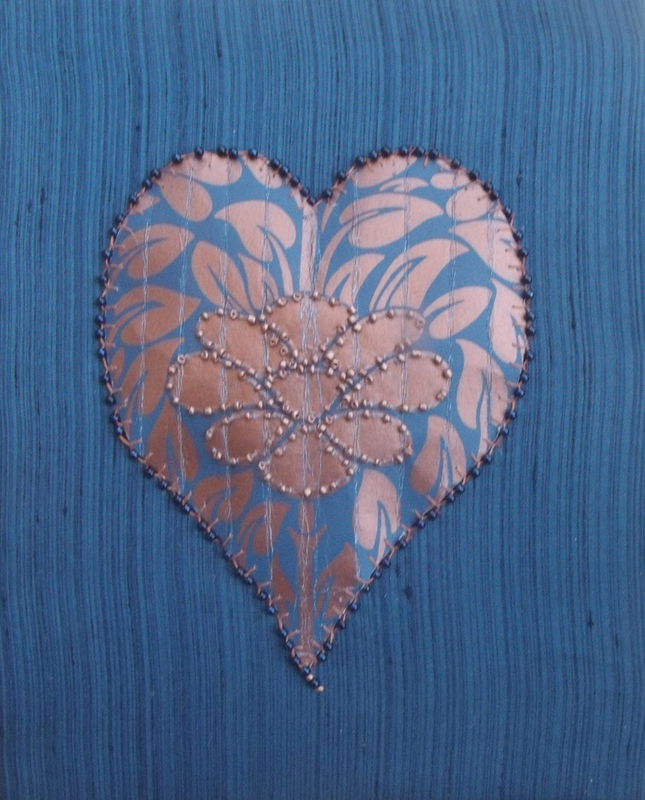 the beaded paper heart by Libby Butler is at last padded and applied to a dark blue fabric ground. 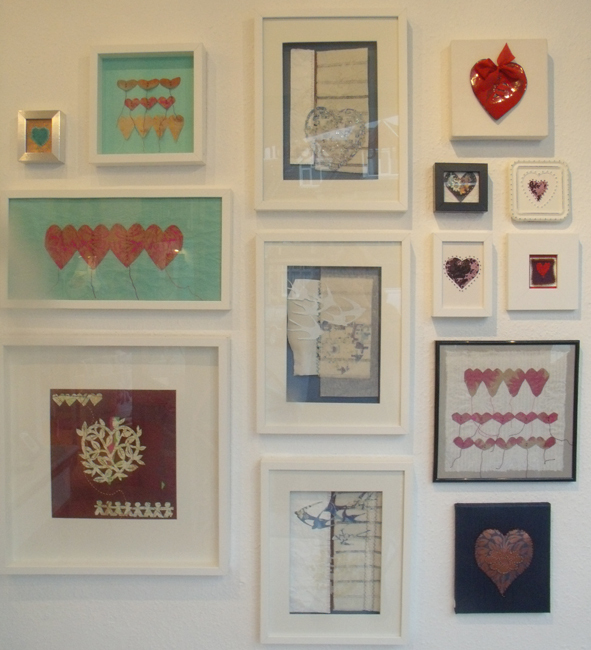 and right at the last minute this evening a lovely folksy map heart came form Kirsten Hill-Nixon…really worth the wait. 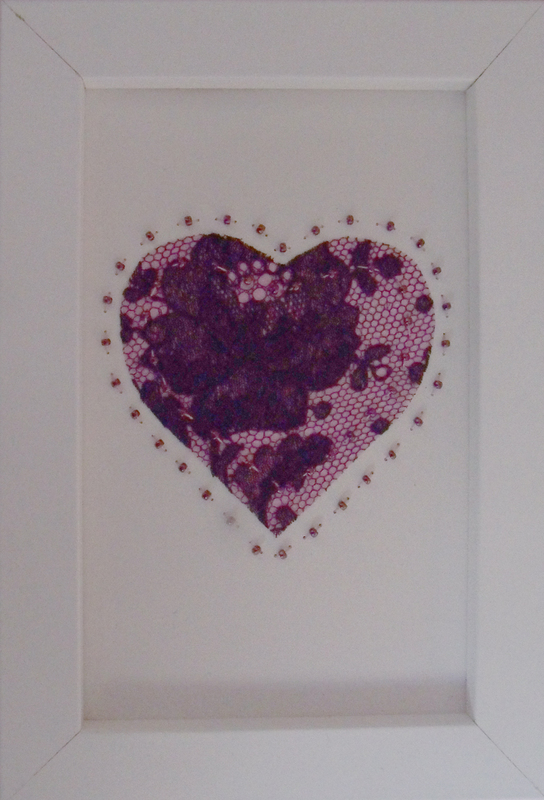 and so for the 14th February 14 heart pictures. 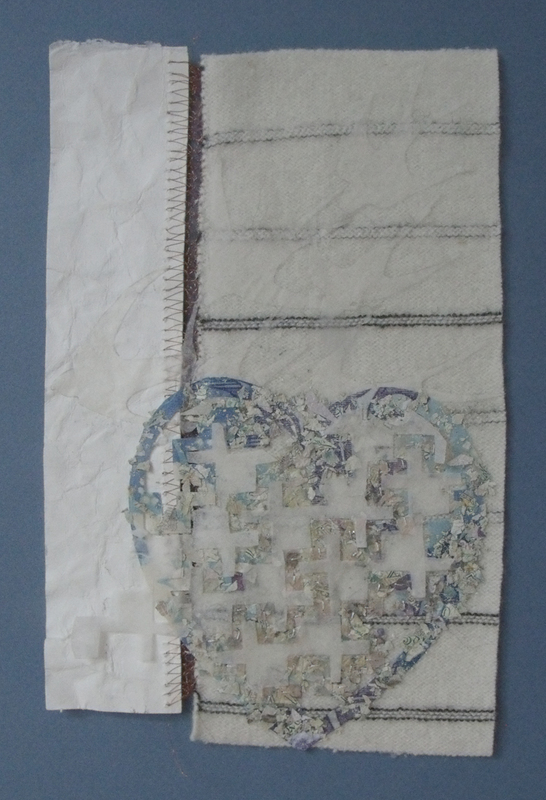 Categories: Heart Space Studios, Hearts, Make - Do and Mend | Tags: hearts, mixed media textiles, paper collages, paper hearts | Permalink.